I found an intersting and funny post from social media for those of you or know people that are boy/girl cray cray! LOL although there is alot of truth to it. I'm no love expert or one those boy crazed girl that runs after every guy that gives a compliment or smiles at me. People always wonder how do you know he or she is the one or whatever. 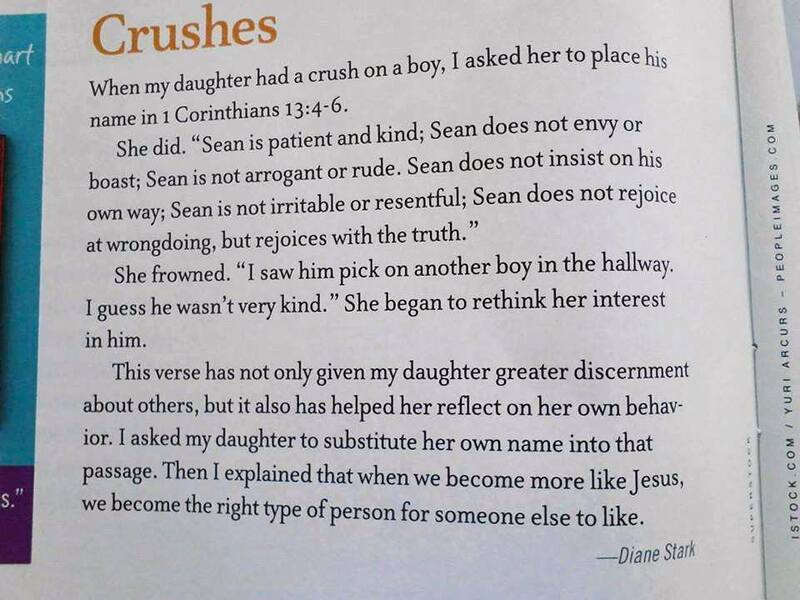 No one is really perfect like Christ, but if you take 1 Corinthians 13:4-7 the love chapter and substitute your crush's name in, then put your name in after reading. If you don't have anyone to cush on that's ok you can use your name to find out if your show these things that are written? Do you show Christ's biblical love? I counted about 14-15 things that talk about what love is. I think sometimes we're about a 12-13 out of 15. Remember there's a differnce between lust and love. This entry was posted in Devotions and tagged 1 Corinthians 4-7, crushes, funny, love, Truth by Tigger. Bookmark the permalink.